Silver is often overshadowed by its more famous peer, Gold, be it forex, ETF's or even futures. Despite gold being more popular, silver does manage to hold its ground. It is no wonder then that silver is often said to be a "poor man's gold." Depending on who you ask, you might get different results. For some investors, silver offers better results, while for some, gold is more a preferred asset in the precious metals category. It is estimated that silver mining began 5000 years ago with the first silver being minted in 3000 B.C. in Anatolia, which is in modern day Turkey. Over the years, silver grew in popularity especially since 1200 B.C. where silver production was said to have moved to Greece, which was later followed by Spain which a decade later became the largest silver producer, sourced through one of its many colonies. What sets aside silver from gold is the varied uses of the metal that goes beyond just a few sectors in manufacturing and as jewelry. Silver is one of the most widely used component as an industrial material compared to gold and thus has more demand both on an industrial and commercial level. Before dabbling in trading silver futures, it is essential to know the characteristics of this precious metal, the factors that influence the supply and demand as well as the futures contract specifications. Here are the 7 things you need to know when trading silver futures. #3 - Which silver futures contracts are more ideal for day traders? #4 - What factors influence Silver futures price prediction? In fact, statistics show that long term demand for Silver has been consistently higher than the supply, indicating the importance of this little traded precious metal. This is also clearly represented on the long term prices for Silver, which as you can see in the next chart has been steadily increasing between the years 2006 – 2012 before silver prices started to decline in the years post-2012. For futures day traders, while the long term trends doesn’t impact the short term trading, it still shows that silver futures can be an alternative or even compliment gold futures trading. In terms of financial or political uncertainty, silver also exhibits characteristics of a safe haven asset/instrument and thus, tends to appreciate similar to gold prices. There are quite a few subtle differences however between silver futures and gold futures. Silver futures are standardized exchange regulated and traded contracts. They are primarily traded at the New York Mercantile Exchange (NYMEX), Commodity Exchange (COMEX) and the Tokyo Commodity Exchange (TOCOM). Silver futures are priced in U.S. dollars and cents on a per ounce basis. Silver futures are denoted by the futures ticker name of SI. Silver futures contracts come with a monthly expiration with trading being conducted on the current calendar month, as well as the next two months. The far out contracts are usually July and December contracts within a 60-month period starting from the current month. Trading on the current futures contract closes on the third-last business day of the month. One standard silver futures contract controls 5000 troy ounces. There are also many different variations to the standard silver futures contract such as the e-mini silver futures and the miNY contracts, which control 1000 and 2,500 ounces. Below is a summary of the silver futures contract specifications. A full $1 move in the SI silver futures contract, which is 1000 points, is equivalent to $5000. 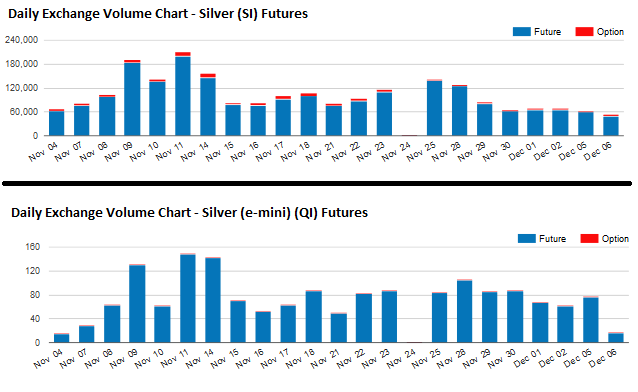 Among the various types of silver futures contracts the e-mini silver futures offers better incentives to trade due to both lower margin requirements and lower tick sizes. The CME Futures' E-mini silver futures contract has the ticker symbol QI which controls 2,500 troy ounces, which is half the value of the standard silver futures contract. With the mini-sized silver futures contract, a full $1 move in silver futures, which is 1000 points, is equal to $2,500. Below is a summary of the QI mini-sized silver futures contract. While Silver futures might offer lower margin requirements and the ability to control lower units, in terms of trading volume comparison between the standard silver futures and the mini-sized silver futures, the larger contracts are more actively traded. What this means for day traders is that the larger silver futures contracts make for a better option to trade. 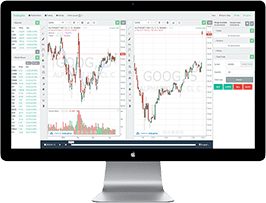 The liquidity that comes with the larger silver futures contracts makes it easy for day traders to quickly day trade the futures markets with relative ease. Whereas, the mini-sized silver futures contracts are less liquid and can be susceptible to volume trades with the lack of liquidity making it difficult to day trade the mini-sized silver futures contracts. As with any commodity the fundamental factors that influence prices of silver futures are supply and demand. 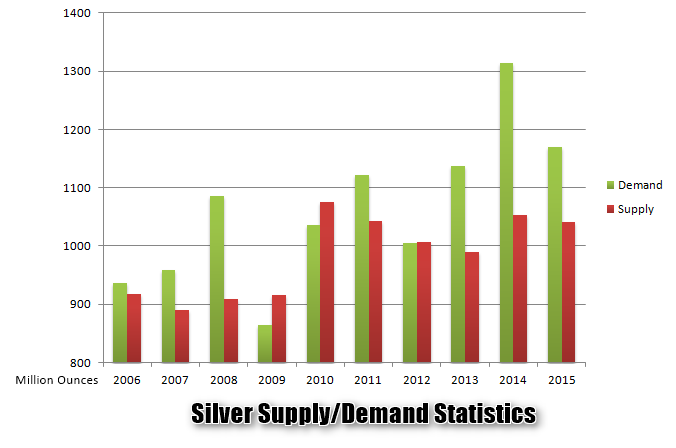 On the demand side, silver finds more uses than gold, especially in the industrial sector. 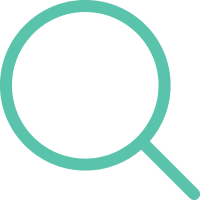 It is one of the most commonly used materials ranging from automobiles to electronics and photography while also being used as a key component in jewelry. On the supply side, silver is primarily mined. The mining costs can play a crucial role as it determines the amount of dollars it takes to mine silver from the ground. It is estimated that it takes around $22 - $30 to mine an ounce of silver. Some of the major producers of silver include countries such as Mexico, Peru, China, Russia, Australia and Chile. Despite being a producer of silver, China also happens to be the largest importer of precious metals in the world. The table below shows the 2015 statistics of the top 5 silver producing nations in the world with output measured in million ounces. Silver prices are quoted in U.S. dollar and as a result, the short term silver prices are influenced by the strength or weakness of the greenback. The chart below shows the U.S. Dollar index on the left and the silver prices on the chart. A rising or a strengthening U.S. dollar index often translates to weaker silver prices, while a weaker U.S. dollar often results in silver prices rising. Thus, the correlation between the U.S. dollar and silver prices are inversely correlated. When trading silver futures, traders need to also pay attention to the fundamental macro-economic developments that influence the dollar’s exchange rate, which tends to impact silver prices as a result. Traders should pay attention to the key economic reports such as GDP, inflation and unemployment data which eventually ties into the Federal Reserve’s decisions on short term interest rates. Usually, a tighter monetary policy sends the U.S. dollar higher which in turn weakens silver prices and vice-versa. Silver Thursday is the name given to the event that occurred in 1980 as the famous Hunt Brothers (Nelson Bunker Hunt and William Herbert Hunt) attempted to corner the silver market. The actions results in a steep decline in silver prices leading to panic selling in the commodity futures exchanges. The Hunt brothers were said to have heavily invested in silver futures contracts through series of trades from different brokers. Over a period of time, the Hunt Brokers were said to have held at least one-third of the entire world's supply of silver which has a dollar value of billions. The purchases eventually led to silver prices rising from $6/oz to as much as $50/oz. It was also around this time that COMEX adopted new roles which had restrictions on the purchase of silver contracts on margin such as doubling the margin requirements and the government imposed restrictions on borrowing money to fund the futures markets. 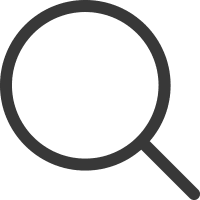 Collectively, this led to a margin call on the hunt brother's silver futures positions which being unable to meet, led to the brokers liquidating the futures contracts. With no buyers to be found, silver prices collapsed from $20 to $10. Silver futures contracts can be extremely risky due to the tick size and the tick value. For traders who are complacent when trading silver, even winning trades can quickly reverse and morph into big losses. Futures traders should there be very careful when trading the silver contracts. Here are a few things to keep in mind when trading silver futures. 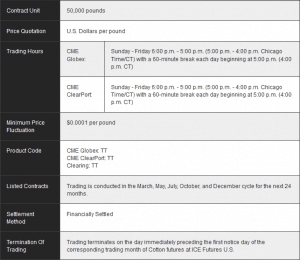 Silver futures contracts are actively traded from 1700 - 1600 CT on a weekday including Sunday with a 60-minute break from 1600 CT. In conclusion, while gold is often the most preferred precious metal, trading silver futures can be also a viable opportunity. However, do not get lulled into being complacent in thinking that because silver is cheaper compared to gold, it is easier to trade. In fact it is the opposite, with a standard silver futures contract controlling 5000 ounces, the risks of sudden sharp price spikes can often leave your trading equity deep in the red. 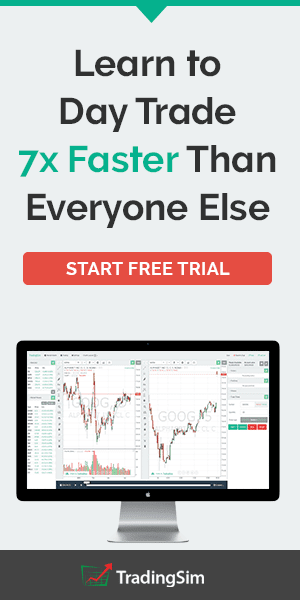 For a trader who has the discipline, a proven consistently profitable futures trading strategy alongside good money management skills will no doubt be able to quickly make big profits trading silver futures.